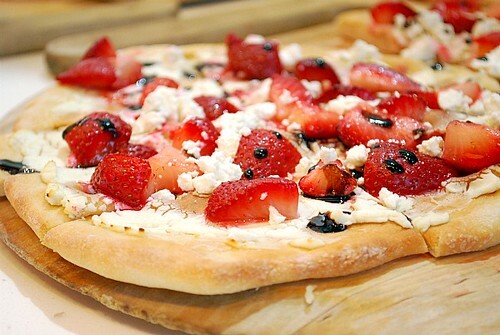 Article first published as Strawberry Goat Cheese Pizza on Blogcritics. Strawberries don't last very long in my house. Either I'm eating a bowl of strawberries drizzled with balsamic vinegar or using them in baked goods. When I came across this dish a few weeks ago at a social event I attended, I knew I had to try making it at home. The whole idea had me intrigued and the flavors worked so well on top of a plain pizza dough. It's simple to prepare, especially if you're using a store bought ball of pizza dough. The dough is shaped however you like, and baked until lightly browned. Meanwhile, strawberries are tossed in a white balsamic vinaigrette dressing. When the pizza has browned, softened goat cheese is spread on top and the strawberries top the pizza. It bakes again for a few minutes and then crumbled goat cheese is sprinkled on and a balsamic reduction is drizzled on top. Easy peasy and oh so tasty! First make a white balsamic vinaigrette by whisking the white balsamic vinegar with the extra virgin olive oil. Next, make an aged balsamic reduction by placing the aged balsamic vinegar in a small saucepan and simmer until it has reduced to about 4 teaspoons. On a lightly floured surface, roll out the pizza dough into a free form shape. Place on a baking sheet and bake in the preheated oven for 10 minutes or until firm and slightly brown. Remove the pizza crust from the oven and spread the softened goat cheese over the top, leaving a 1/2 inch border around the pizza. Toss the strawberries with the white balsamic vinaigrette and arrange the strawberries evenly on top of the softened goat cheese. Return the pizza back to the oven and bake for 10 minutes. Remove from the oven and sprinkle the crumbled goat cheese over the top. Drizzle the aged balsamic reduction over the pizza and sprinkle with black pepper. Garnish by topping pizza with a few leaves of arugula, frisée or basil if desired. sounds delicious. I made one at Valentine's Day with mascarpone. Need to give goat cheese a try! "2 cups fresh strawberries, hulled &amp;amp;"
The pizza looks diciouse. I can cook with my kids cooking tools. Thank you.